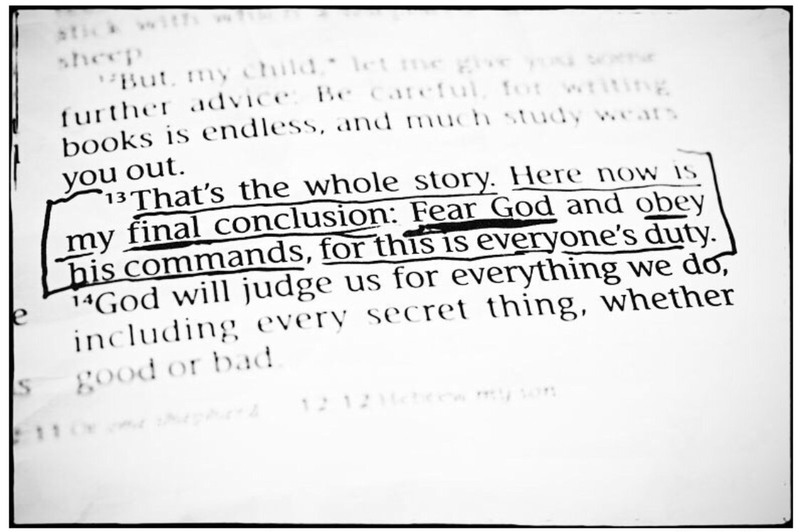 Fear God and obey his commands, for this is everyone’s duty. That’s the whole story. Here now is my final conclusion: Fear God and obey his commands, for this is everyone’s duty. Throughout Ecclesiastes, Solomon attempts to put life into perspective. He urges us to remember that the things we most often rely on for our happiness are just temporary. This includes our possessions, our relationships, our wisdom, and our work. These things are important, certainly, but only God can bring us genuine, lasting contentment. Our life is best aligned well when we’re primarily concerned with pleasing him by living lives of gratitude and obedience. Everything we have, including our very existence, ultimately belongs to God—and one day we will have to answer for how we have managed these gifts. In Ecclesiastes 3:17, Solomon warns that one day God will judge all of us for how we’ve lived. God assigns this task of judging to Jesus alone (John 5:22-30). He will judge and reward his followers for the quality and character of their acts of service (2 Corinthians 5:10). He will also preside over the final judgment, when each person’s ultimate destiny will be determined, once and for all (Revelation 20:11-15). Dear God, Abba Father, Jesus my Lord and Savior. I need You, I love You, I’m sorry, forgive me, thank You. You are my refuge, my strength, my light. Help get ready for today and the new week ahead. Jesus, you were the master communicator, and I want to learn from you. Reveal to me opportunities to be an ambassador for your goodness in my daily work. Show me how to be attentive to you, to myself, and to others amidst a busy schedule each day. And help me to understand how to live fully aware of your presence in this digital age. Use me to help others experience the fullness of your life and light. Amen. Be - Be Humble.., Be truly moderate.., Be gentle.., Be honorable.., Be chaste.., Be open, Be listening, Be ready, Be in the moment, Be in the now, Be there!